MDC congratulates Jason Reynolds on breaking the state record by catching a 6-pound, 14-ounce walleye on a jug line. WARSAW, Mo. 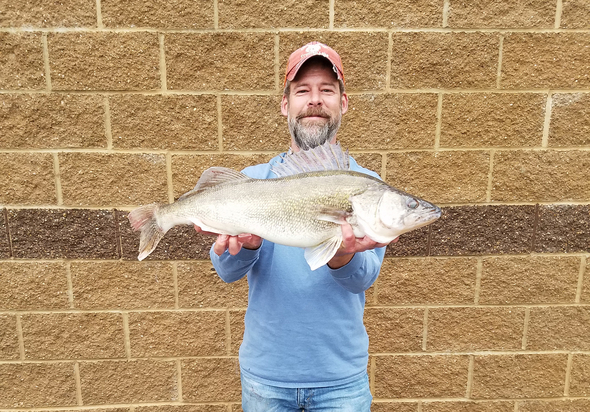 – The Missouri Department of Conservation (MDC) reports Jason Reynolds of Warsaw became the most recent state-record-fish breaker in Missouri when he caught a walleye on a jug line on Truman Lake in Benton County. The new “alternative method” record fish caught by Reynolds on Nov. 5, weighed 6 pounds, 14 ounces. Reynolds’ recent catch broke the previous state record by 1 pound, 1 ounce. Reynolds was using bluegill for bait and trying to catch blue catfish when he caught the new state-record walleye. Reynolds said he didn’t know the walleye was a state record until he checked MDC’s website when he got back to Osage Bluff Marine. Reynolds also currently holds the spotted bass alternative method state record for a fish taken by jug line. MDC staff verified the walleye’s weight on a certified scale at Lost Valley Hatchery in Warsaw. This is the seventh state-record fish of 2018. Missouri state-record fish are recognized in two categories: pole-and-line and alternative methods. Alternative methods include: throwlines, trotlines, limb lines, bank lines, jug lines, spearfishing, snagging, snaring, gigging, grabbing, archery, and atlatl. For more information on state-record fish, visit the MDC website at http://on.mo.gov/2efq1vl.